Generating club speed is often a matter of rotation and swing technique. Hitting a golf ball straight is one of the keys to the game. But when your club head speed is slow, the ball tends not to go very far. One of the keys to hitting the ball farther and maximizing your driver and long-iron game is to increase the rotation on your swing, thus increasing the speed of your club head at impact. The result is a longer hit and less distance between you and the hole. Visual a rod running from the bottom of your spine to the ground. This rod will hold your spine in place during your swing. Increase the centrifugal force of your club head by rotating around your spine instead of using your head as the rotation point. This will create a more ideal turning motion with your body, instead of a simple up and down backswing. Create a throwing motion out of your backswing. What this means is that, at the top of your backswing, if you pull the club out of your non-lead hand (the hand farthest from the hole), it would be in perfect position to throw a baseball; wrist cocked and the arm and elbow forming an L out from your body. 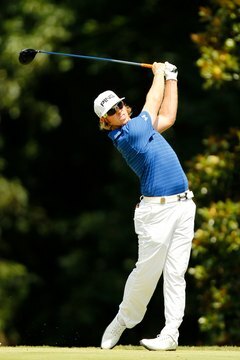 Hold that cocked wrist position down to impact, releasing at that split second before your club head meets the ball. This will encourage you to use body rotation as opposed to trying to generate speed just with your arms. Rotate your forearms through impact. The rotation of the forearms should occur at exactly the same moment as the breaking of your wrist from the cocked position. Timing of the release and uncocking of the wrist is vital to solid contact. Swing through the ball. It's important that you don't let up once contact has been made with the ball. The speed of your swing will slow down resulting in less power behind the ball.